At US Budget Bash for UN Diplomats, Meatballs & Dreamers, Reform on Calendar? UNITED NATIONS, October 12 -- With the Obama administration under pressure to cut costs, the US Mission to the UN on Wednesday night threw a reception for members of the UN General Assembly's budget committee. 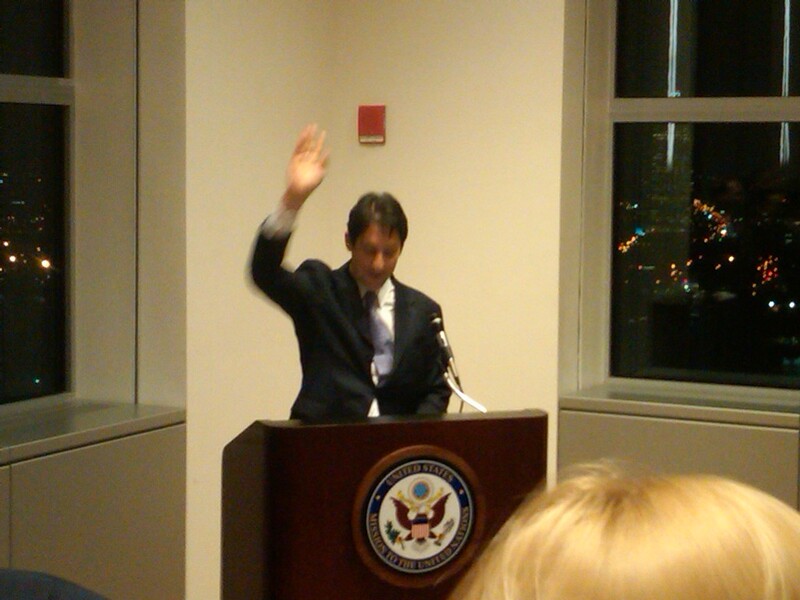 US Ambassador for Management Joseph M. Torsella -- his new Twitter handle is more colloquial -- told the well dressed crowd that every dollar wasted is a lost opportunity for the world's poor. He saluted budget committee chairman Tomo Monthe of Cameroon for saying this session will not, as the ritual has it, extended right until Christmas eve. Monthe also shepherded through the Durban III review, which the US boycotted or chose not to participate it. But so it goes at the UN. Amid the veal meatballs and pasta there was some serious talk of management change. A longtime staff expert lobbied two members of the Advisory Committee on Administrative and Budgetary Questions that jobs that are given out politically should be disclosed as such, so that sham recruitments are not held. This would apply, for example, to the new head of UN Peacekeeping, Herve Ladsous, who was in the house. Admit that these jobs are given out by nationality, the reformer pleaded, but let the others be given cleanly. An ACABQ member nodded, then extensively greeted another Under Secretary General. The reformer shook his head: it is this incestuous world that stops reform. One wonders where Torsella will take it. He inveighed against delay and waste in the UN's UMOJA project - but Under Secretary General for Management Angela Kane, also present, has said that is all on track, or only delayed due to changing accounting rules. ACABQ will apparently consider the matter on Friday. There is an emerging question of how US demands for UN cost savings will impact UN peacekeeping missions, for example in Sudan. On the margins there was more only at the UN material: the Permanent Representative of Equatorial Guinea, for example, saying that his president Obiang has the votes to put his name on a UNESCO prize. A Slovak diplomat bragged how his country broke from the Eurozone's bailout of Greece, which he said has a higher standard of living that Slovakia which is supposed to pay for it. The reformer was still preaching, how Fifth Committee members, and those leaving ACABQ, are given jobs in the UN system to make them vote for the budget. Will Torsella get into this? We'll see -- watch this site.